This item is covered by ShoppingBest Return Policy. Cons: The item listed is Kingston KVR800D2N5K2/4G, which is CAS latency 5 (N5) and is a kit of two sticks that are guaranteed to be identical for dual channel memory which combined total 4GB (K2/4G). The item sent is two each of Kingston KVR800D2N6/2G, which is CAS latency 6 (N6) and is a single stick that is 2GB (2G). The sticks are low profile. The CAS latency issue is the deal breaker and completely unacceptable. False advertising. Pros: I don't think there is a pro. It's been a month and still haven't received the RAM. I will make sure not to order from World Digital Store again. Pros: Works as it should, reasonable price, passed Memtest no issues, works just fine in my Dell vostro 220s htpc. Cons: Did not know it was half-height ram, I've never seen or heard of that before! I thought I had ordered the wrong type of ram. Other Thoughts: -Would recommend for some cheap ddr2 ram if you can't find something used locally. Pros: Matches model # specified. Works fine. Shipped quickly. Cons: Didn't come in Kingston package shown in picture; looks more like they buy a case of 100 and re-package themselves. But it works well. Pros: Bought two sets, installed with no problems, easy peasy. Pros: I ended up with two 2 GB sticks, each labeled "KVR800D2N6K2/4G", "KIT OF 2, 1.8 V". The chips and boards were clean, but there were witness marks on the card-edge connector, where I believe they were previously installed in a socket. They are only about 3/4" (19 mm) tall. It appears to be genuine Kingston RAM. The hologram stickers look OK. All the text matches on the two hologram stickers. On the part number stickers, three out of the four lines match; the third line is different and might be a serial number (it is of the form xxLxx-x9xHxx-xWxxB). Each stick has sixteen Hynix HY5PS1G831C DRAM chips on it, plus the SPD EEPROM. The Hynix chips are additionally marked "KOR", "FP-S6 C 103V", and a varying line of the form "MWHABXEnxxn". I believe that "103V" probably means the third week of 2011 - more below. I installed these sticks with no other RAM. The system ran through one full set of Memtest86+ (about 30 minutes) and didn't show any errors. Memtest86+ detected the timing as 6-6-6-18.
decode-dimms (Linux) also agrees with the 6-6-6-18 timing. It also says the RAM is "SSTL 1.8V", and supports CAS 6, 5, and 4. (I haven't tried it at anything besides CAS 6, though.) It also identifies Kingston as the manufacturer, manufacturing location 0x06, manufacturing date 2011-W10, and a 32-bit serial number for each stick. The serial numbers are relatively close to each other - about 5,000 numbers apart. Running it in the system, it seems to work OK. I can have a couple of separate instances of Firefox running and it doesn't swap, which is not the case when I had only 2 GB of RAM installed. As I write this, the system has been up for about 7 hours, running various applications, with no apparent problems. Cons: Given the fact that these didn't come in original Kingston packaging, the probable January 2011 date on the RAM chips, the March 2011 date in the onboard EEPROM, and the marks on the edge connectors, I am pretty sure these are used. (I bought this RAM in October 2017). That's not the end of the world, but I wish it was disclosed somewhere on the ad. On the other hand, maybe these were enough clues that the modules were used: 1) This RAM was one andrew jackson, while the equivalent parts from mooshy kin, g'z kill, or coarse air start at twice that on Newegg. 2) Kingston sells these modules new on their site, but only on a build-to-order basis, and two modules would be about three times what this pair was. 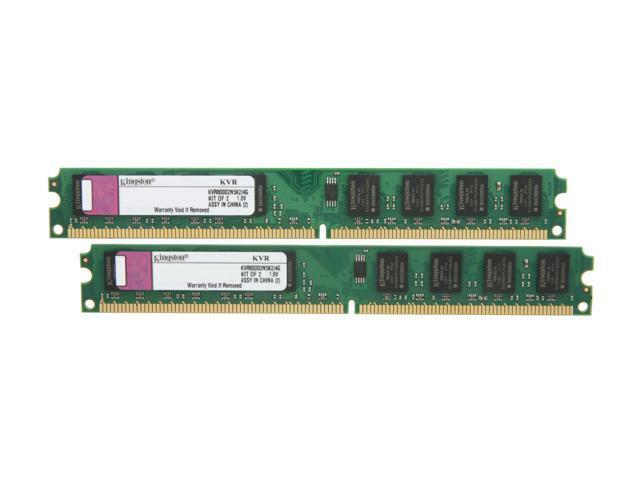 3) DDR2 RAM is not exactly the latest technology sensation. The packaging was... economical. It shipped in a padded kraft mailing bag, 5" x 7.5". Inside that was a pink static-shield plastic bag, heat seamed down the middle to make a compartment for each stick, and then across the end to close it. It didn't have the plastic clamshell trays that new RAM typically comes in. On the other hand, free USPS shipping. My motherboard has only 2 RAM slots - it had 2x 1 GB coarse air sticks before this upgrade. I wanted it to run a little better than it did, but I didn't want it bad enough to go for a newer motherboard, CPU, etc. For one andrew jackson, this RAM woke it up enough to buy me another year or two of use, so I think it's a good deal. The parts shipped from Boca Raton, Florida, via USPS first-class mail.